Can we have a heart to heart? I know I was scared to make my own pasta for too long. If you’re like me, I totally get it. But now, I’m no longer scared and I actually feel dumb that I was so scared for so long. With the help of my stand mixer and the KitchenAid pasta attachment, it made it much easier for me to get it done and make pasta so quickly. I texted this picture to my friend, Lindsay, and she said you’re obsessed now right? She knows me so well. Yes, I’m obsessed and I keep trying different flours. I can’t wait to share more with you what I’m making. I made a quick two minute video on how easy it is to make homemade pasta with KitchenAid. If you like the video after watching it, do you mind giving it a thumbs up? I totally appreciate it!! This is a really short post because like I said, I hope you’ll watch the video and say oh my goodness, it’s so easy, I want to try it right now!! And come back later this week, I’ll have a KitchenAid surprise for you! And be sure to check out Naomi’s Brownie Pie…she’s such a genius using the pasta attachment to roll out pie dough! Place eggs, water, flour and salt in mixer bowl. Attached bowl and flat beater. Turn to speed 2 and mix for 30 to 60 seconds. Add more water if the dough is too dry, in 1/2 Tablespoon increments. Change out the flat beater for the dough hook. Turn to speed 2 and knead for 2 minutes. Remove the dough and knead by hand for 2 minutes. Let it rest for 20 to 30 minutes. Cut dough into four pieces before processing with pasta sheet attachment. Take one piece and flatten into a rectangular shape. Adding flour to both sides. Be sure to cover the other pieces. Attach the pasta sheet roller to your stand mixer and set it to #1. Turn on the stand mixer to speed 2 and run the pasta dough through the pasta sheet roller. While on #1, fold the dough in half and run it through again. I do this several times. Adding a little bit of flour on each side of the dough again, change setting to #2 and pass the pasta dough through the sheet roller. I do this twice and then twice each on #3 and then #4. If you want thicker dough, don’t do the #4 setting. 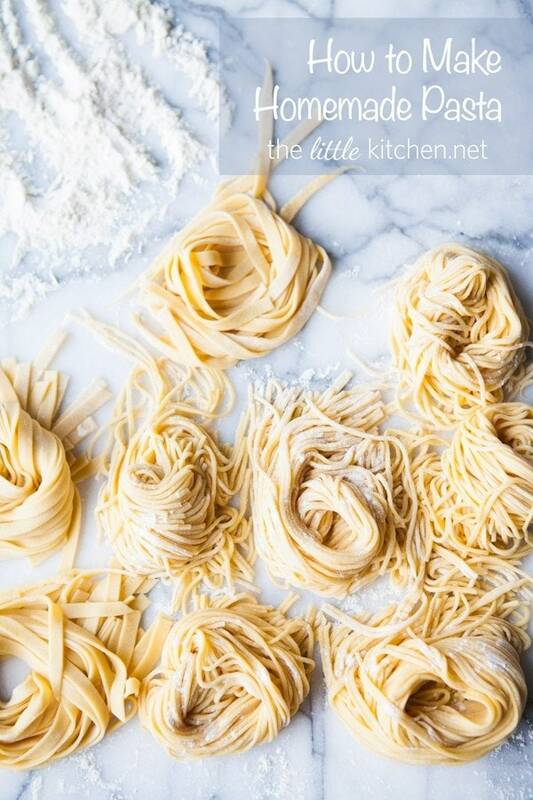 Once again, add flour to each side of your long pasta sheet. Change the attachment to your spaghetti or fettuccine cutter and turn on to speed 2. Run the pasta sheet through and with your left hand, hold on to the pasta as it comes through the cutter. It’s usually really long so I cut it and then wind it around my hand to create a nest. 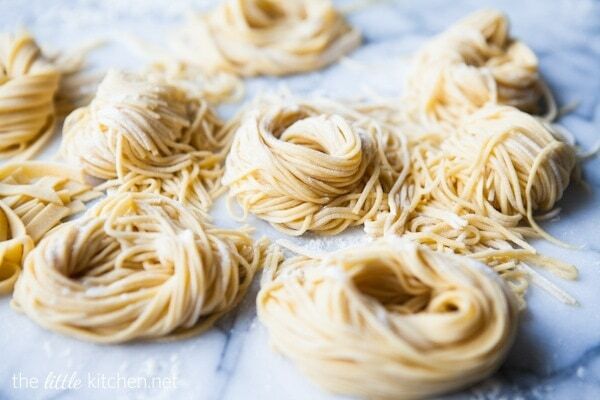 Allow pasta to dry for a few minutes before boiling. When boiling your pasta, it only needs 3 to 7 minutes to boil. 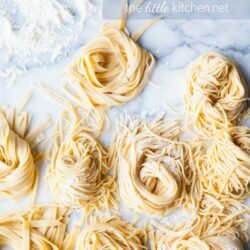 With this pasta recipe, I prefer the fettuccine cutter. If drying your pasta, hang on clean plastic clothes hangers or a pasta drying rack for at least an hour. 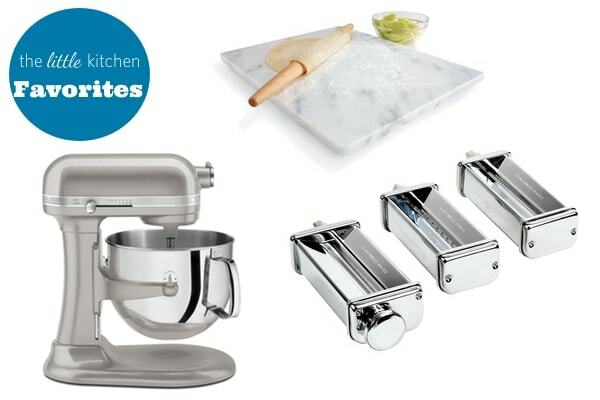 Disclosure: I received a stand mixer and the pasta roller set from KitchenAid for the purpose of review. I only work with brands I love and you’ll always get my honest opinions. This post contains affiliate links.